It’s only fitting that a local Knights of Columbus council is forming a “brigade” in defense of the smallest members of society — the unborn. That’s exactly what members of the Knights’ Council 9981 at Incarnate Word Parish in Chesterfield are doing as they prepare to launch next month a parish “Baby Bottle” campaign and larger “brigade” in an effort to raise funding to help Thrive St. Louis, a group of local pregnancy resource centers. 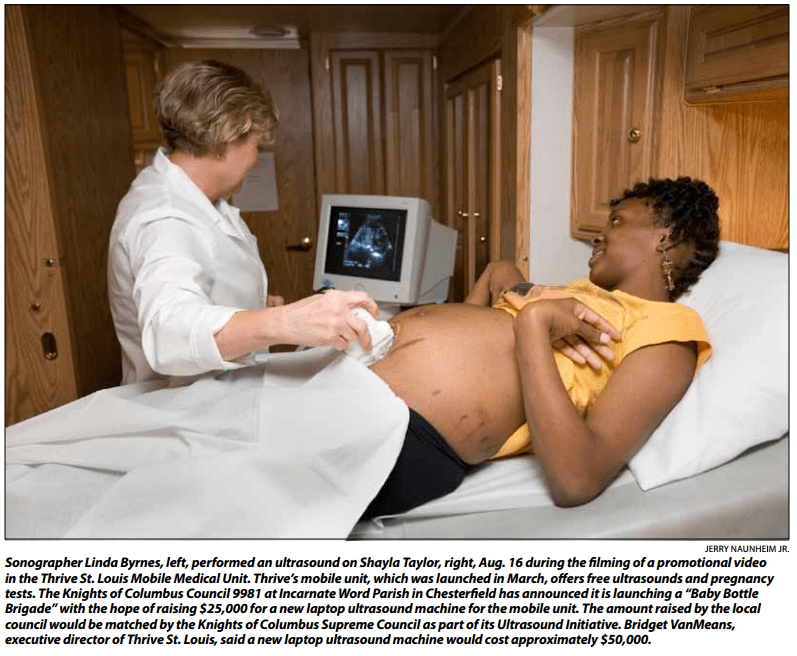 The local project stems back to a statewide “Meet Life” campaign (formerly known as the Ultrasound Initiative), recently launched by the Missouri Knights of Columbus, which would provide funding to purchase ultrasound machines for pregnancy resource centers. The statewide initiative also is tasking the Knights to seek ways to place pregnancy resource centers in areas of Missouri where there are none. State deputy Applebaum said that the “Meet Life” campaign, officially announced last month at the annual organizational meeting for the state Knights of Columbus, has a goal of reducing by one half the number of abortions in Missouri by the end of 2016. The Missouri Knights have been collaborating with the Knights’ Supreme Council, which established the Ultrasound Initiative in 2009 to help raise funding to purchase ultrasound equipment for qualifying pregnancy resource centers. Joseph Dalton, a member of St. Patrick Council 2627 in Rolla who is helping coordinate the statewide effort through In His Image Ultrasound, said the Missouri Knights are expected to have 12 machines installed in pregnancy resource centers by the end of the fraternal year, which ends in June 2012. In the St. Louis Archdiocese, a machine already has been placed in a center in Park Hills, another has been placed in House Springs, and South County Pregnancy Help Center is expected to receive one later this year. Dalton said other St. Louis area centers are in the application process. The Knights also are collaborating with the Vitae Foundation to create a multimedia promotional campaign. The goal of that is to help direct women to pregnancy resource centers. At Incarnate Word in Chesterfield, the “Baby Bottle” effort is two-fold, according to Schultz. The first part is to raise $25,000 through the parish, school and PSR to go toward the purchase of a laptop ultrasound machine for Thrive St. Louis’ Mobile Medical Center, a 35-foot recreational vehicle that was introduced earlier this spring and provides services in North and South St. Louis and near the Planned Parenthood abortion clinic in the Central West End. If the local Knights’ council is successful in meeting its goal, the amount will be matched 100 percent by the Knights of Columbus Supreme Council. The Knights plan to distribute approximately 3,000 baby bottles during Masses the weekend of Sept. 10 and 11, and will ask participants to collect spare change over a four-week period. Incarnate Word Knight Steve Dickhut said the council developed the idea from Lutherans for Life, which coordinated a similar effort among 10 churches and seven schools, raising $30,000. The donation went toward outfitting Thrive’s Mobile Medical Unit and its operating costs. 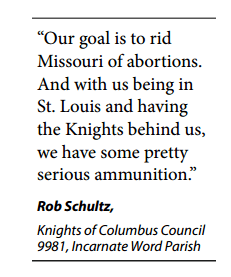 The second phase of the campaign, said Schultz, is a “brigade,” in which the Knights will invite other councils in the St. Louis area, schools and other interested organizations to duplicate its efforts to raise funding for additional ultrasound machines and support for pregnancy resource centers in the area. The Knights also have teamed up with fellow Knight and parishioner Chuck Neff, president of the Salt River Production Group, which this week filmed a promotional video for the parish campaign. For more information on the “Meet Life” campaign, call Doug Kissinger at (417) 336-2023 or email dkissinger@centurytel.net. Those who want to financially assist in purchasing an ultrasound machine should contact Lou Holtmann at (636) 285-1600 or email loukofc@yahoo.com. Donations can be sent to “Meet Life,” Columbian Charities, c/o Lou Holtmann, 7007 Carriage Hills Meadows, Cedar Hill, MO. 63016. For more information on the Baby Bottle campaign, visit www.IWknights9981.com/bbb2; email KofCBBB@IWknights.com; or call (314) 576-5366, ext. 10.